Już po raz drugi w tym roku TKP w Edmonton zorganizowalo paint night, ktory poprowadzila dr. Izabella Orzelski Konikowski. Wczorajszego sobotniego popoludnia w dolnej Sali Domu Polskiego zameldowaly sie 52 panie chętne do nauki malarstwa. Tym razem impreza otwarta była dla szerszej publiczności a więc oprócz naszych polskich dziewcząt przybyly również Kanadyjki, ktore były zachwycone formą prowadzenia tego malarskiego popołudnia. Wiele z pań nigdy przedtem nie miało pędzla w ręku ale dzięki własciwemu instruktarzowi każda namalowała i zabrała do domu pięknie namalowane „Lilie Wodne” według francuskiego malrza Claude Moneta. Dziekujemy serdecznie Towarzystwu Kultury Polskiej w Edmonton za znakomity pomysł na spędzenie sobotniego zaśnieżonego popołudnia no i oczywiście Izabelli za swietny instruktarz. Nastepny Paint Night będzie miał miejsce wisną przyszłego roku. 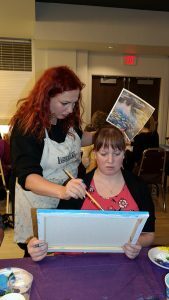 For the second time this year Polish Culture Society of Edmonton organized a paint night, which was led by dr. Izabella Orzelski Konikowski. Yesterday afternoon in the Lower Hall of the Polish Home there were 52 ladies willing to learn painting. This time the event was open to a wider audience and so, apart from our Polish girls, there were also Canadians who were delighted with the form of running this pictorial afternoon. Many of them have never before had a brush in their hands but thanks to the proper instructor, each painted and took home beautifully painted “Water Lilies” according to the French painter Claude Monet. Thank you to the Polish Cultural Society of Edmonton for a great idea to spend Saturday snowy afternoon and, of course, dr. Izabella for a great instructions. The next Paint Night will take place next year. Thank you so much to you and your husband for sharing your teaching, organizing, enthusiasm and art talents. My Mom was very keen to come to the session at the Polish Hall this last week. This is very unusual because last time, for the Van Gogh class, she came as a favor to me. She absolutely loved the experience and was so very proud of her work. She even showed it off at the next family gathering! She told me that now she understood why I enjoy art so much. This was an enormous break through as she has felt it’s been a waste of time that could be spent more constructively. This time was also great fun and she was focused, proud of her work and had a mental break from all the projects and work that keep her so busy. I wanted to let you know just how much your sharing of talents has touched our lives.